This summer, a flurry of emails called into question the legality — under Federal Emergency Management Agency (FEMA) and Sarasota County regulations — of new construction at 95 Avenida Messina in Siesta Village. A writer identified only as “Concerned Citizen” contacted county Building Official Kathleen Croteau and county Code Enforcement personnel in early June about redevelopment of the house and the addition of a pool and tiki hut. The work appeared to be going on without the proper permits, Concerned Citizen wrote in an email. As Croteau indicated to The Sarasota News Leader in a recent telephone interview, the owner of the property seemed to be the real focus of the complaints. 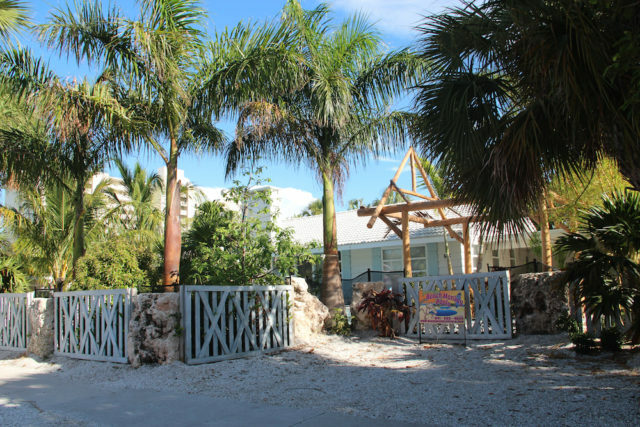 The owner apparently is Shawn Kaleta, who was under fire last year on Anna Maria Island for undertaking construction without the necessary permits and allegedly causing damage to city property, as reported by The Islander newspaper on Anna Maria. 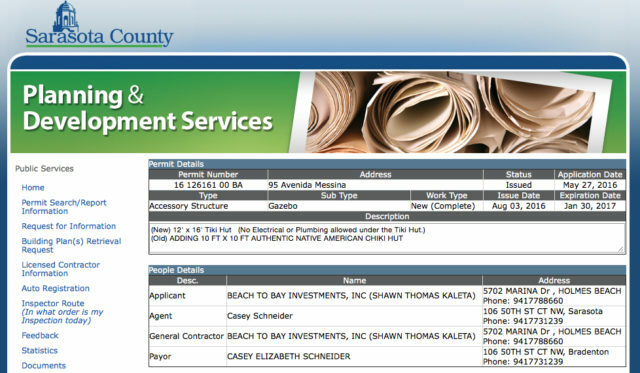 Shawn Thomas Kaleta of Holmes Beach is identified in county documents as the applicant — through Beach to Bay Investments — for the permit for the 12-foot by 16-foot tiki hut at 95 Avenida Messina. 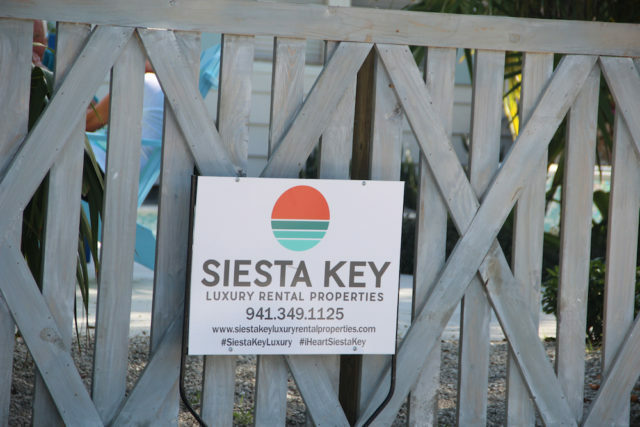 The county Property Appraiser’s Office shows that the property is owned by Siesta Key Beach House LLC, with a Holmes Beach address. The house was purchased in December 2015 for $926,000 from the Wildenburg Family Trust. 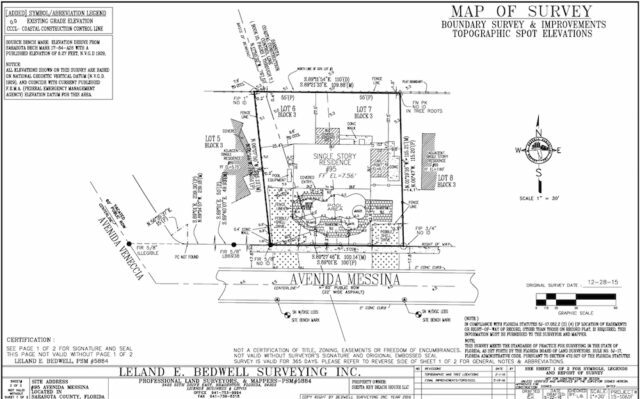 The land encompasses 12,192 square feet, according to the records. 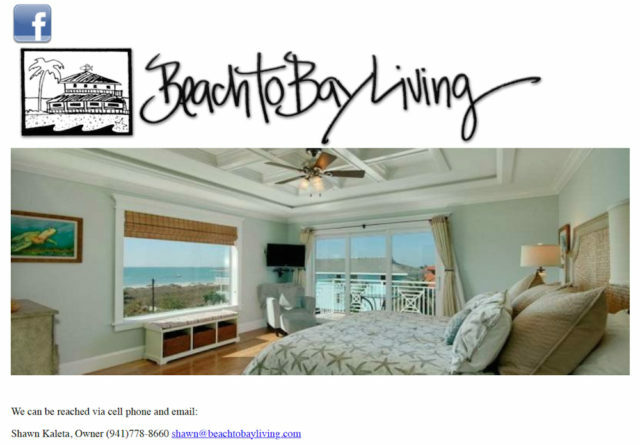 A check of the state’s Division of Corporations website shows Siesta Key Beach House’s registered agent is attorney Louis Najmy in Bradenton. The limited liability company was organized in December 2015 — two days prior to the purchase of the 95 Avenida Messina property. The Concerned Citizen on Siesta Key questioned whether work on and around the house was in violation of the state’s Coastal Construction Control Line (CCCL) and whether Kaleta was violating the FEMA 50-percent rule that requires a structure in a floodplain to be elevated if renovations to it will cost more than 50 percent of its appraised value. As of Aug. 9, Croteau said, county Building Department records continued to show a number of permits for ongoing construction, including those for a tiki hut and an addition on the rear of the house. She wrote Concerned Citizen in June to say that Code Enforcement issued a Notice of Violation for the beginning of work on the tiki hut without the necessary permit. The application for that permit subsequently was submitted, she added. According to county records, the addition involves bedrooms and bathrooms and a new roof “to tie into existing, new windows, new doors,” along with the addition of a driveway. The permit was issued for that work on Aug. 3, according to county records. The pool has been completed and inspected, Croteau noted in an email to Concerned Citizen. She added in early June that while the original permit application indicated an aluminum fence would be erected around the perimeter of the pool, the contractor submitted a revised application for the necessary rock/wood wall. “The plans reflect compliance and staff will ensure during inspection the safety barrier meets the minimum requirements of the Florida Building Code,” Croteau wrote. The state Building Code does require “a safety barrier to completely surround the pool perimeter,” Croteau confirmed for Concerned Citizen. 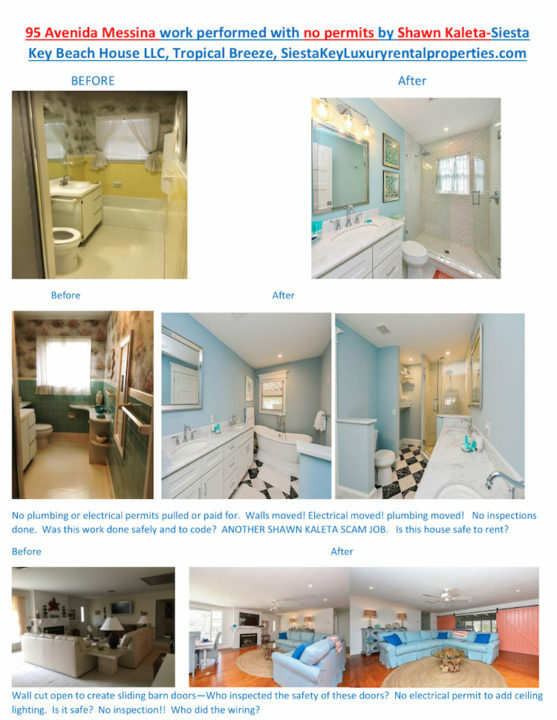 ‘Concerned Citizen’ emailed these before and after photos to Croteau in June, showing scenes from the interior of the house. The images were provided to the News Leader. She told the News Leader that the pool had been completed and inspected by county staff. Yet another matter Concerned Citizen cited involved rocks in the right of way by the house. Croteau told the News Leader last week that she understood that matter is being addressed with county staff members who handle land development rules. “They were going to make sure they were compliant in the end,” Croteau told the News Leader, referring to the owner and contractors. A complaint about signs in the right of way — apparently those advertising the property is for rent — was resolved in early June, county records show, after a courtesy Code Enforcement notice was issued. Yet another complaint — regarding the installation of irrigation systems without a permit — was determined to be unfounded, according to county records. “We’ll keep monitoring the site,” Croteau told the News Leader. If any other issue came up, she said, county staff would address it. The fee ranges between $2,450 per week in late August to $14,994 for the weeks of Christmas and New Year’s, the website says. The highest fee in the spring of 2017 is $12,250 for the week of April 15. During the Aug. 2 meeting of the Siesta Key Village Association (SKVA), guest Esther Quiles took a few minutes to explain that she is in charge of new arts and activities projects for children for the Siesta Key Crystal Classic International Sand Sculpting Festival, which will be held Nov. 11-15 at the public beach. Introduced by Ann Frescura, executive director of the Siesta Key Chamber of Commerce, Quiles said her focus will be a program that will compare Siesta’s 99-percent quartz sand to sand from other areas. SKVA Vice President Mark Smith added that sand will be brought in from places around the world — including Japan. The Saturday, Nov. 12, schedule for the Crystal Classic calls the program The Learning Curve. Planned from 2 to 2:30 p.m. that day, it will entail a lesson about the origins of Siesta’s sand. “Be inspired by our ‘hands on’ arts and crafts session for children,” the program note adds. “Something exciting and new and creative,” Quiles pointed out at the SKVA meeting. Students who attend the Sarasota School of Arts & Sciences will assist her, she added. One hundred children are expected to participate in the program. Sarasota County Supervisor of Elections Kathy Dent has announced several changes in polling locations, effective with the Aug. 30 primary, as the News Leader reported last week. The focus for Siesta voters concerns those who have been going to St. Michael the Archangel Church, located at 5394 Midnight Pass Road. On Aug. 30, Precinct 411 voters will cast their ballots at The Devyn Event Venue, located at 7113 S. Tamiami Trail in Sarasota, instead of the church, Dent reported. The elections office will be mailing out new voter cards, containing new polling place information, to all affected voters, a news release added. 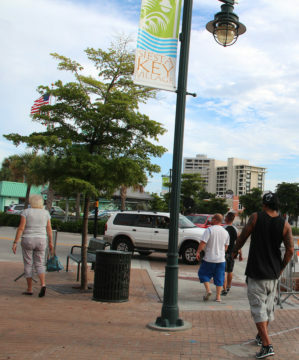 In his monthly report to the SKVA on Aug. 2, Michael Shay, the liaison between that organization and the Siesta Key Village Maintenance Corp., said the palms in the Village were trimmed the previous week, so those were looking good. He further noted that Buccaneer Landscape Management had let go the employee who had been handling the Sunday garbage pickup, but the company has a new person on the job. Therefore, Shay said, he hoped problems the Village experienced in July would not be repeated. Buccaneer handles the Village upkeep through a county contract whose expense is covered by the Maintenance Corp. The garbage comment prompted Kay Kouvatsos, co-owner of Village Café, to ask what had happened to the lids of garbage cans in the Village. “They were being refurbished,” Shay responded. Workers were painting those on the east side of Ocean Boulevard, he added, when they ran out of paint, which ended up being on back order. The painting should be concluded this month, he said. 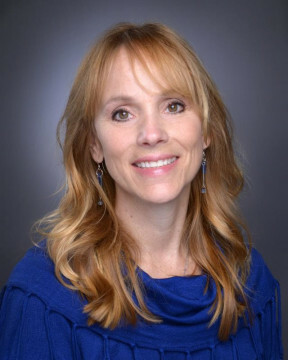 Stephanie Brown, general manager of the Siesta Key Oyster Bar (SKOB), reported that the restaurant had experienced the same problem, which was an issue related to Frontier’s service. The SKOB bought a $10 cellphone, Brown continued, so its staff could call people back. Because of problems linked to Frontier Communications’ acquisition of Verizon in the Tampa Bay region, Brown noted, a class action lawsuit has been filed against Frontier. Frescura said that Frontier had promised to send a tech support person to the Chamber on Aug. 2 to remedy the situation.